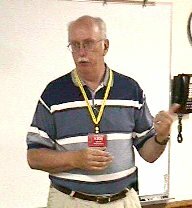 The July meeting of the Rochester Amateur Radio Club was called to order at 7:00pm, Tuesday 7/9/02, by President Dave Peterson (K7CJO), with 25 members and 7 guests present. Minutes from the June meeting were approved as posted on the web site. The .82 repeater amplifier failed, and was fixed. It will likely fail again soon. If you hear a problem with the repeater, let the tech committee know. Still working on getting the huge pole up at the JOTA site. We've had very successful events so far this year. The two upcoming events are the Rochester Centurion bike race this Saturday, and the half-marathon August 17. Check the web site for details. ID cards are being distributed. If you haven't got yours yet, check with Steve. Please check in to the Sunday night net if you possibly can. Mayo radios are being reprogrammed. Security is tight at Mayo now, and procedures will need to be revised. We may get a standard ARES vest for operations. A preliminary report is posted on the web site. QSO's were very much better than last year, and total points were better. The August picnic is planned for August 17, starting at 11:00. Bring a grill if you can, the club will provide charcoal. Bring meat to cook and a dish to pass. Bring your own utensils and beverage. There will be a foxhunt (transmitter hunt) exercise. The location is not decided yet; in discussion, people supported Foster Arend, Oxbow, and Quarry Hill parks, as well as Chester Woods. Check the web site for the final choice. Following the meeting, Jay Bellows spoke. He is the director of the Dakota Division of the ARRL (our region). He discussed a wide variety of topics, ranging from the structure of the ARRL to PRB-1 to international spectrum issues. Some ARRL activities directly relevant to our club include the possibility of offering emergency communications courses in Rochester; the internet logbook for certificates, coming soon; and the ARRL Big Project, interacting with schools.